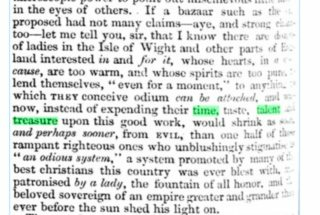 I am 50 years old, and I just became aware of widespread usage of "Time, Talents, and Treasure" in religious circles, maybe especially Catholicism. My own religion, Mormonism, has a temple covenant about consecrating time, talents, and "everything with which the Lord has blessed you, or with which he may bless you" to the LDS church. And I was not aware until recently that it might be a conscious deviation from an old triplet. Does anybody know from where the pithier version originates? My completely uniformed guess would be that it might have originated in some sort of Catholic catechism or papal pronouncement. Is this alone not a sufficient reward for all the expenditure of time, talent, treasure and life by the friends of colonization? Isle of Wight Observer (Ryde, England), Saturday, June 11, 1853; Issue 41. The Parable of the Good Samaritan. He gave his time to help the man, he used his talents to tend to the man's wounds and he gave his money (treasure) to pay for the man's lodging. “Prison workout” — what is the origin of this term? What is the origin of the phrase “pilgrims and strangers in the/this world”? What is the origin of High Street (and Highway)?